CREDITS: DWE has entertained our troops in Bosnia, Kosovo, Kuwait, and Iraq. Starting at the age of 9, Ryan D Schell got the magic bug by watching a mime perform a magic trick, and as we say in the biz... the rest is history. His first major performance was at the age of 12 for University High School's Halloween staff party. Ryan is a member of the prestigious "Magic Castle" in Hollywood and is the only member to be accepted into the academy by performing one trick. He has also worked as a stage assistant to the world famous Rudy Coby and has performed for Lionel Richie & Jimmy Conners. He just recently finished touring with the Edward's Theatre Circuit, which lasted over 7 years. He is also a favorite of our Armed Forces in Kosovo, Sarajevo, Kuwait, and Iraq. 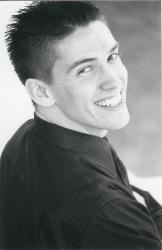 With his quick wit and big smile, Ryan D Schell can and will entertain anyone he comes across. Whether it's his close-up magic or stand-up MagiComedy, Ryan is sure to entertain. Just don't ask him about his tie!